Glide along Dubai’s calm waters to discover the emirate’s distinct charms. Dhow Cruise in Dubai is one of the popular things to do in Dubai and absolutely should be featured in a Dubai visitor’s travel bucket list. A ‘Dhow’ is a traditional large ship, lateen-rigged and consists of one or two masts. These sturdy, sailing vessels were once mostly used as trading ships in Arabic countries. Now, these are used as a popular recreational cruise, mainly in Dubai. If you are visiting Dubai, you will surely be looking forward to a Dhow Cruise Dubai tour. A Dubai Cruise with a delicious dining experience and Tanoura dance is something you should not miss on a Dubai holiday. However, when you are booking the tour, bear in mind that you get to choose between two types of Dhow Cruises Dubai Experiences. There is Dhow Cruise Dubai Creek which is quite familiar among tourists and has been operational since the Dubai tourism boom. The recent addition of Dhow Cruises in Dubai is at Dubai Marina which has been developed in recent years but has managed to capture the attention of globetrotters visiting Dubai. Both Dubai Creek and Marina cruise experiences are unique in their own way. Dhow Cruise Dubai Creek or Dhow Cruise Dubai Marina – Which one to choose? Now the question that looms in front of you while planning your Dubai tour is which of the Dhow Cruise experience should you choose for your holiday? This would totally depend on what kind of experience you want and how much you can spend on it. The main factors of difference in both cruises are location, ambience, and budget. Location – The location and cityscape of both these cruises are quite distinct. Dubai Marina and Dubai Creek are two different locations within Dubai. Dubai Creek is a reservoir flowing through the emirate, dividing it into Bur Dubai and Deira. A cruise on Dubai Creek has a traditional touch to it and lets you experience contrasting sights of Dubai -The old Dubai and modern Dubai. You can view the fascinating historic sights and traditional souks of Dubai against the backdrop of high-rise, impressive modern architecture, and towering skyscrapers. Dubai Marina is a classy waterfront residential arena built in recent times around 30 kilometers away from Dubai Creek. It is manmade canal city located along the shorelines of the Persian Gulf that has been termed as the ‘New Dubai’. Here, every element exudes opulence and sophistication. A cruise on the Marina offers you an absolutely contemporary experience of New Dubai. Ambiance – Being at two different locations, Dubai Creek and Dubai Marina presents its visitors with entirely different mood and settings to experience. Ambience-wise, Dhow Cruise Dubai lets you witness the ordinary lifestyle and daily routine of locals in Dubai. The cruise takes you past contrasting sights of Dubai to emphasis on how drastically Dubai has changed over the years. The experience highlights more on historic aspects and gives insight into how Dubai as a city functions on any normal day. Dubai Marina, on the other hand, exudes a lively and vibrant ambiance teeming with leisure, recreational and enjoyment. A cruise along the waterfront lets you experience the awe-inspiring architecture and sprawling modernistic infrastructures of new Dubai in swanky dhows equipped with the finest leisure services. The best way to experience a Dhow Cruise Marina is after dusk when Dubai Marina illuminates into a dazzling spectacle. Cost and quality of service – Both Dubai Creek dhow cruise and Dhow cruise Marina offer gastronomic, entertainment and sightseeing experiences. But then, Dubai Marina Dhow Cruises provide you with a much more relaxing and luxury experiences. With Dubai Marina cruise, you get a high level of quality service and hospitality experience as compared to Dhow Cruise Dubai Creek. You can indulge in a Dhow cruise experience fused with high-end leisure services, lip-smacking fine dining, live music, and entertainment amid stylish, elegant surroundings. This also means that Dubai Marina Cruise is more expensive than Dhow Cruise Dubai Creek, but the experience you get is worth the splurge. A simple Dhow Cruise with Dinner at Dubai Creek would cost about USD 20 per person whereas the Marina Dhow Cruise with dinner price would cost around USD 40 per person at Dubai Marina. 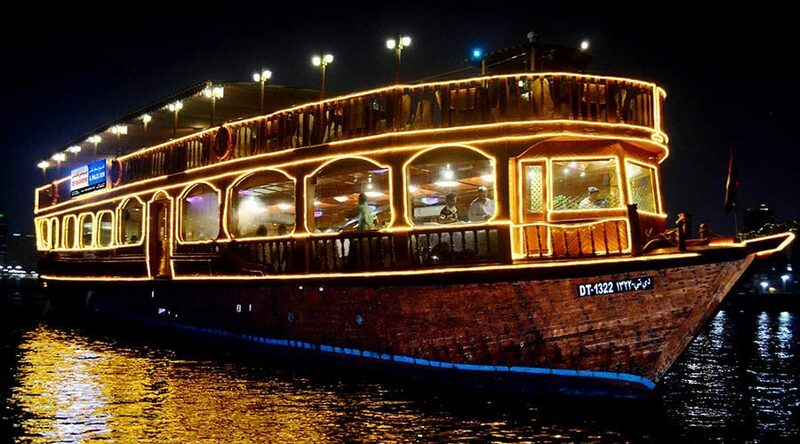 Al Khaleej Floating Restaurant at Dubai Creek: Hop onboard a Bedouin styled ship transformed into a charming restaurant and set sail to watch the beauty of Dubai city unfold. This traditional dhow glides calmly on the Dubai Creek as you enjoy a time filled with good food, great music and fascinating views of the emirate. As you pass by traditional souks, abra harbours, wharfage and heritage sights, you realize how far Dubai has progressed – from being a desert village to a stellar global city. Delve into a scrumptious buffet dinner along with the soothing music and traditional Tanoura dance entertainment. The restaurant has two decks and has the capacity to seat upto120 people. Aisha Floating Restaurant at Dubai Marina: Explore the dazzling brilliance of futuristic Dubai on a cruise along the Dubai Marina. One of the best dhow cruises in Dubai marina – Aisha Floating Restaurant is perfect for unwinding your day with a scrumptious international dinner as you glide past the breathtaking views of Dubai Marina. Along with the stunning view, enjoy the melodious music and a stunning performance by Tanoura dancers.